Wednesday, January 24, 2018 7:00 p.m.
D. Communication/correspondence from the Public-anyone who wishes to address the Board on issues not included on this agenda will do so at this time. A. Discuss, consider, and take all necessary action to reduce and reorganize the curricular and extra-curricular programs offered by Chambers Public Schools beginning in the 2018-2019 school year. B. Discuss and determine compensation benefits for Mr. Stairs. C. Approve contract for music position. Next Meeting: February 19, 2018 at 7:00p.m. 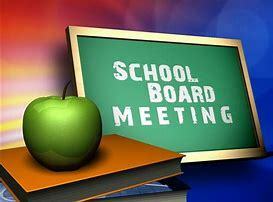 An agenda for the meeting, which shall be kept continually current, is readily available for public inspection at the Superintendent’s office during normal business hours. Time Limit: The board requests that you limit your comments to 3 minutes or less on any agenda item or topic. No more than 30 minutes of public feedback will be allowed on any certain topic. General Rules: Please remember that this is a public meeting for the conduct of business or the Board of Education. If you wish to address the Board please sign in on the clip board that will be provide at the meeting. The Board of Education reserves the legal right to convene in “closed session” for discussion of any and/or all agenda items that may legally be discussed in a closed session R.R.S. 84-1410.